Little Gems is pleased to announce our new line of Children’s Jewelry, made from our unique, non-toxic, and eco-friendly gems. These hand-cut beads direct from India resonate with their crystalline vibrations, offering a unique experience for children to adorn themselves with real gemstones. Magnetic clasps allow for ease of use, allowing children to dress up by themselves and combine into various lengths and combinations. Magnetic clasps also provide a safety feature by unclasping when tugged too hard. These necklaces and bracelets are for ages 4+. Necklaces are 15”. These adorable necklaces can be worn from preschool age through the teen years. Necklaces can also wrap around the wrist to become funky double wrap-around bracelets. And hey, maybe Mom can borrow it sometime too! 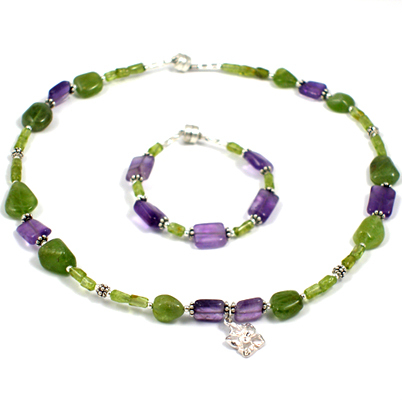 The Purple Garden design features bright colors: purple Amethyst, green Peridot, and Sterling Silver. The Necklace has an adorable Sterling Silver Flower charm.